02/12/2016 15:00:31.828 SETUP (0x1cc8) 0xc40 Click-To-Run Telemetry aqdyq Monitorable TryHandleClientError::HandleStateAction: Another Scenario Running. Showing Error UI. 02/12/2016 15:00:31.828 SETUP (0x1cc8) 0xc40 Click-To-Run Telemetry aoh9g Medium TryShowUI::HandleStateAction: Failure has occured, admin has disabled failure UI. 02/12/2016 15:00:31.828 SETUP (0x1cc8) 0xc40 Click-To-Run Telemetry ami7r Medium TryShowUI::HandleStateAction: Showed Failure UI. Couldn’t start Office installation We’re sorry, but we could not start your Office installation. Another installation is in progress. Please try again later. 02/12/2016 15:00:31.828 SETUP (0x1cc8) 0xc40 Click-To-Run Telemetry aoh9z Medium AdminBootstrapper::Main: Installation came back with 17003. 02/12/2016 15:00:31.829 SETUP (0x1cc8) 0xc40 Logging Liblet aqc99 Medium Logging liblet uninitializing. This wasn’t completely unexpected as I have used this computer previously to create my Office 2013 App-V packages. But I had never encountered it so I was not sure where to look to clean up the previous install. Enter Process Monitor. I fired it up, reproduced the issue, stopped the trace. Although the trace was only a few seconds, this will likely result in thousands or ten of thousands of operations being captured. This “noise” can quickly be cleaned up, though, using filters. I figured the likely culprit would be in the registry, so I started with limiting results to RegQueryKey. From there, I filtered for the only processes involved. 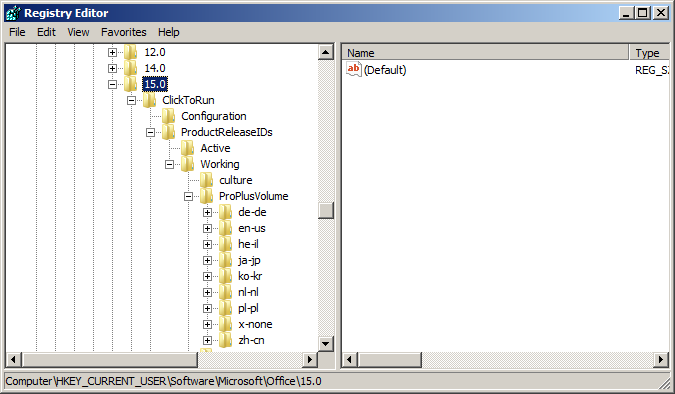 With ODT, this is setup.exe which then calls OfficeClickToRun.exe. From here, I could see HKEY_CURRENT_USER\Software\Microsoft\Office\15.0 was being touched. Note, that whatever version of Office you are packaging should not be installed on the machine where you are doing the packaging so any key created here would have been done by the ODT setup. Simply delete this key and run setup /packager again.